To verify results of calculations to determine impact speeds or impact positions. To demonstrate why the conclusions advanced by other experts are incorrect. At Crashteams we use the simulation software tools that are industry verified and widely accepted. These include HVE, PC Crash and others. Crashteams experts use these tools when the case requires it. 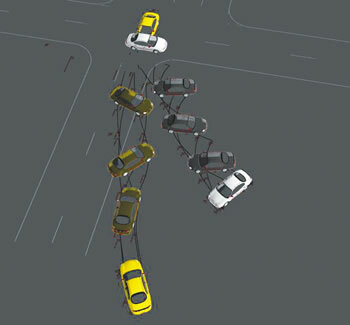 Simulation of car crashes requires the user to input the conditions of the impact which includes impact speeds, wheel resistance, roadway surface conditions, steering angles and more. Once those conditions are inputted, the user “ runs “ or “ plays “ the resulting simulation. The idea is to generate a simulation which is consistent with the actual vehicles motion as exhibited by scene evidence. The user will confirm that the vehicle movement matches the physical evidence. Experts then present the courts with facts about the input conditions, assumptions, and the accuracy of the software. At Crashteams, we use simulations and can verify the input conditions to withstand a rigorous cross examination regarding the simulation software.